There are many great attractions and restaurants in San Jose that people have no clue exist. This could easily be solved with improved signage in the Downtown core and other parts of San Jose such as Japantown. SPUR recently took a field trip to London and found some of the best signage around. 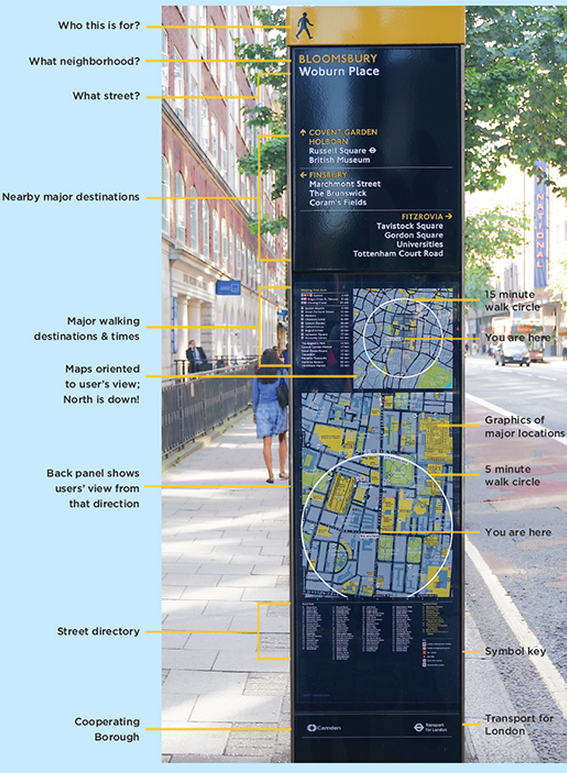 Each post had a full directory of major attractions and what you can find within a 5 minute walk and a 15 minute walk. The signs are also consistent, so once you get used to one you can easily use any of them. Not only should we consider something like this for San Jose, but I think we should take it a step further and put a Silicon Valley spin on it. We should make interactive digital signs. Not only would they stand out even more and look cool, but they could easily be modified when new restaurants and attractions come in. A portion of the sign could even be used to promote events similar to the signpost banners that are being used today. Imagine all the creative things you could do with an interactive digital sign. With a cheap camera you could look into another location such as another part of San Jose or even a sister city. You can turn the signs into a game (explore Downtown and find them all, be submitted for a drawing of some kind). They could be used to display local art. The possibilities are endless. I personally think that digital signs would be a bad idea in reality (due to breakage, vandalism, blue screens of death, etc), though appealing on paper. I'd rather see them be wifi hotspots (Sorry Wickedly Fast, you never seem to work for me, alas) akin to the idea being discussed in NYC with their payphones. I agree with not using digital signs. Simple is better. I like the sign in the pic. I too agree on not going digital on the signs. The downtown is changing too fast for static signs, they need to be digital or they will be installed and obsolete in six months. They need to say "Jazz Festival" during Jazz, then "Christmas in the Park" during the holidays etc... they need to be flexible and easy to update. Oh, and we are the capital of Silicon Valley, we should look like it already.